The various styles of PVCu windows are differentiated according to how they operate and all have advantages and disadvantages for particular applications. Whilst conventional casement PVCu windows are the least expensive and most popular, tilt and turn PVCu windows can be cleaned from the inside, whilst sliding sash PVCu windows are designed to replicate those in Victorian style properties. However, wider outer frames are required for both tilt & turn windows and sliding sash windows in order to accommodate the more complex operating systems and locking mechanisms than those on standard casement windows. 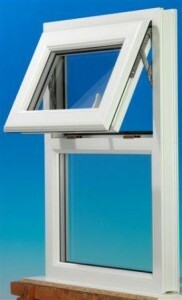 These wide outer frames subsequently reduce the glass area and can look bulky, particularly on small PVCu windows. Casement windows are the most popular type of window installed in the UK and are fitted with one or more opening vents (or casements) which open outwards either from the side or from the top. They are normally combined with fixed panes within the same window frame. Tilt and Turn windows open inwards into the room and as the name suggests, can either be tilted inwards or swung (turned) inwards on the hinges, by operating the handle in a different position. 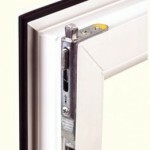 Tilt and turn opening vents can also be combined with fixed panes. Sliding Sash windows replicate the traditional vertical sliding wooden windows often seen in Victorian style properties and are probably the most expensive of all PVCu windows. 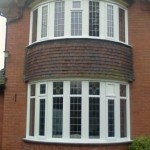 Sliding sash windows can be fitted with an optional tilt facility to enable the windows to be cleaned from inside. Bay windows consist of more than one window frame fixed together with reinforced bay poles between them, so that the bay window follows the shape of the supporting brickwork below. The space created by the curved or rectangular shape of the bay is part of the internal room. A Bow window, or a plant-on bow as it is properly referred to, also has more than one window frame and projects beyond the external brickwork without being supported by it. 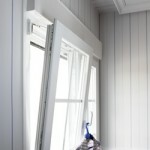 A bow window can replace a flat window and provides a deep internal window sill whereas a bay window does not. 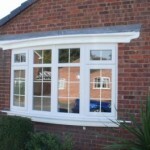 PVCu Windows: What is PVCu? Polyvinyl Chloride (PVC) is a chemical compound of chlorine, carbon and hydrogen originating naturally from petroleum, natural gas and sodium chloride (common salt). PVC is commonly used in plastic sports bags and some shoes after being modified by softening it with the addition of plasticisers. Un-plasticised Polyvinyl Chloride means that the product has not been modified and therefore not softened, but in its pure form it is still not entirely suitable for windows and doors. Stabilisers and additives are required to improve its durability, and ensure that it is UV stable and does not discolour. The amount of these additives differs from one manufacturer to the next to form different compounds, though two common additives are acrylic to harden the compound and Titanium Dioxide to make it appear whiter. 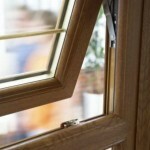 How many different types of PVCu profile are there for PVCu windows? The term ‘PVCu profile’ refers to the cross section (shape or profile) of the various extrusions and there are hundreds of different types of extrusions for PVCu windows and doors. The more common ones being manufactured by Deceuninck™, Duraflex™, Rehau™, Synseal™, Profile 22™, Network VEKA™, Plastmo™ and Kommerling™. Each manufacturer has a number of different product ranges to serve both commercial and residential customers and within each range there are individually shaped profiles for PVCu windows and doors. Breaking it down even further, different shaped extrusions are required for window and door outer frames, sashes, casement vents, door leaves, glazing beads, bay poles, sills, mullions and transoms. PVCu windows are also available in a wide range of colours including 6 different shades of white, woodgrain effects attempting to replicate, mahogany, oak and rosewood among others, and solid colours such as red, blue, black, green and cream. When specifying white PVCu windows it is important that the frames and sills are made from the same compound and therefore are the same shade of white. O1 is the whitest shade of white but it would be unsatisfactory to fit it onto a creamy coloured white sill. The issue is highlighted when it comes to conservatories as many installers use conservatory roofs and frames from different manufacturers. This could result in the frames being a different colour white to the roof spars – and sometimes a different white again from the sills and trims. Those PVCu extruders which manufacture their own PVCu profiles for the many types of window and door frame, conservatory roofs, trims and sills are therefore at a distinct advantage as they can offer a colour match across the full range of products. One of the many reasons for replacing your existing windows is the excellent safety and security features offered by the very latest advanced PVCu windows. Old wooden windows generally have 3 mm single glazing fixed into the frame with either putty or an external quadrant bead held in with panel pins. 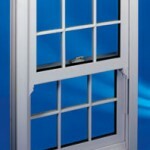 Even the early PVCu frames offered very little in the way of resistance to potential burglars, with externally glazed windows, poor locking systems and frames without reinforcement.